The art of cleansing is the foundation of any skincare regimen! One of the methods that has taken the spotlight recently in the modern skincare world is cleansing oil. The ways in which we clean our face have transformed over the years. From your grandmother’s cold cream to the squeaky clean foaming cleanser of your teenage years, there have always been a variety of ways to get your skin clean. And, here at Graydon, we believe in setting aside a few minutes each evening to cleanse off the day, both physically and energetically. Granting yourself extra time to give your face some love can be truly transformational -- and with our Keto Cleanse's rich buttery coconut aroma, the experience is truly intoxicating. While cleansing oil seem totally new to some, using oil to clean and purify the skin has actually been around for thousands of years. Ancient cultures from around the world used some of the same natural plant oils that we use today to remove dirt and grime from the skin. What’s old is new again. So, how does cleansing oil work? It begins with the basic chemistry principle of 'like dissolving like'. So, oil actually dissolves the excess oil that builds up on our skin throughout the day that clogs our pores. It's important to note that your skin naturally produces a type of oil itself, called sebum. This beneficial substance maintains our skin’s natural pH balance while also protecting and moisturizing. This cleansing oil is essential oil free and will thoroughly remove unwanted congested oil and grime, while simultaneously moisturizing the skin and protecting it. MCT Oil • derived from coconuts, this extremely light oil is excellent at breaking down dirt and grime on your face. Ghee • a staple in the Ayurvedic world of skincare, ghee is considered to have time-tested skin balancing qualities. Coconut Oil • rich and aromatic, our raw cold pressed coconut oil protects your skin with anti-microbial qualities. 2. Start at the chin and work your way up around the mouth, jaw, cheeks, eye area and end up at the forehead, using small circular motions to massage the cleansing oil deeply into your skin. 3. You can incorporate the same kind of movements you use when using a normal cleanser. However, this cleansing massage should take about two to three minutes if possible, so really take the time to massage the oil in across the face. Note that using our Keto cleansing oil to massage your skin ALSO helps promote blood circulation and lymph drainage, reduces the appearance of fine lines and wrinkles, softens pores to help decongest the skin, as well as the fact that this process is incredibly relaxing. 4. Wet a washcloth or ideally your Bamboo Charcoal Konjac Sponge with hot water (you want it to be steamy and warm, but not scalding) and press it against your face. Hold it against your face for a minute, to steam and activate the oils. Breathe deep, then buff away thoroughly. It seems strange to cleanse with an oil but the results are amazing! Keto Cleanse - Love it! 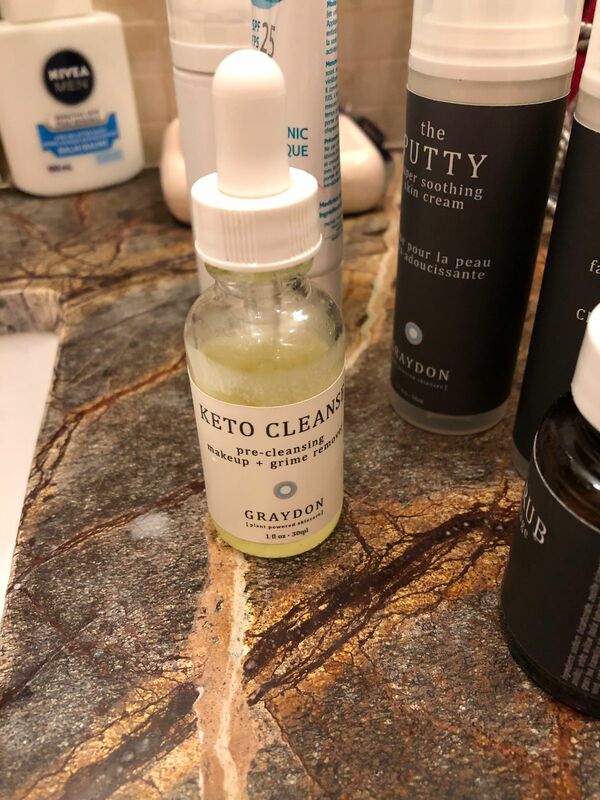 The keto cleanse is a nice way to start my night time cleansing routine. I use this first and then the face foam. My skin feels soft and clean when I am done. Thank you for the great products Graydon! I have incredibly sensitive skin and horrible eczema and these products have done amazing things for my skin! I also use the aloe milk cleaner, the body wash, body lotion and the face food both after moisturizing and as a makeup primer. I am going to try their shampoo and conditioner next! Absolutely amazing products and would 100% recommend them to anyone, my skin has never looked better! Doing an oil cleanse is new to me. I do the oil cleanse first (rinsing off with the Bamboo Charcoal Sponge) and then wash with the Aloe Milk Cleanser. My face looks very happy afterwards, and there is no dryness or tightness as a result of this double cleanse. I am confident that all my make-up is being effectively removed, and my skin is clean. Would definitely recommend this to anyone considering doing a double cleanse. I use this to remove my makeup and then follow with the face foaming cleanser. Awesome makeup remover and gentle on my sensitive skin! So good for make up removal especially for eye make up. Try it with our Bamboo Charcoal Sponge for the ultimate deep clean.